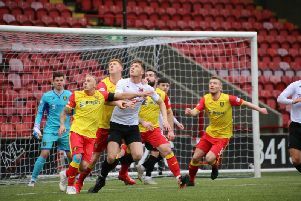 Berwick Rangers twice came from behind to beat Stirling Albion in a ding-dong match at Shielfield on Tuesday to secure a welcome victory which lifted them to fifth place in the second division table. Jordyn Sheerin scored twice for Berwick, with a penalty and the winning goal, but he was denied his hat-trick when he missed a second penalty in the closing minutes. Berwick’s other goal was scored by Greg Hurst, with both Stirling counters coming from Dylan Bikey, who had an impressive first half for the visitors. The former French fourth division player netted twice in the opening 45, twice giving Stirling the lead at 1-0 and 2-1. Conditions were far from ideal with steady rain making the surface slippy but it was Stirling who made the brighter start with Bikey giving the visitors the lead after only six minutes when he turned a defender on the edge of the box and slotted the ball low under goalkeeper Kevin Walker. Berwick’s response was immediate and within a minute they were back on level terms, when Hurst found the net with a header from close range, turning in a cross from the right. Bikey, who had a strong run forward, looked dangerous every time he was in possession, and in 23 minutes the Berwick defence stood off him on the edge of the box and he coolly slotted in a second goal for Albion with a precise left-foot shot which found the bottom corner. A minute later Bikey was again involved, setting up Angus Beith, but his first-time shot was blocked on the edge of the six yard box. Berwick were handed a lifeline back into the game in 36 minutes when William Robertson tripped Hurst on the corner of the box and Sheerin netted from the penalty spot, although Chris Smith managed to get a hand to the ball. Ex-Berwick striker Blair Henderson had a quiet first half, but just before half-time he saw a glancing header dip over the crossbar and at the break it remained 2-2. Early in the second half Beith had a close-range effort cleared off the line by Jonny Fairbairn as Stirling tried to regain the initiative. But the second 45 was tame compared to the first and one of the few Rangers’ chances fell to Greg Rutherford, whose low shot was saved by Smith, whilst at the other end Henderson headed narrowly wide from a free-kick. Berwick introduced Samuel Perez, the elder brother of Newcastle’s Ayoze, who made his debut from the bench for the final 20 minutes, and whilst he didn’t have the same impact as Bikey, he showed he could be a useful addition to the squad. Sheerin then produced a moment of magic for what turned out to be the winning goal in the 81st minute. Picking the ball up on the right, he cut inside and curled a left foot shot past Smith into the far corner. Sheerin was then brought down and Berwick awarded a penalty in the 86th minutes, but the striker saw his second spot kick of the night saved by the visiting keeper. To add to Stirling’s misery, manager Dave Mackay was sent to the stand by referee Gavin Ross in injury time, whilst Darren Petrie was also red carded right on the final whistle. After the game Berwick manager John Coughlin was full of praise for his players. “I thought we showed great resilience to twice come behind and win the match,” he said. Of the deal to sign Spaniard Perez, he added: “We have signed him for a month, but he has had to sign as an amateur. “He has been in the north east of England and that is an avenue we are looking to develop further. Berwick: Walker, Hamilton, Beveridge, Notman, McKinlay, Fairbairn, Thomson, Hurst (Perez 72), Rutherford, McKenna (Watt 92), Sheerin (Hogg 92). Stirling: Smith, McGeachie, Colquhoun Dickson 37), McMillan, Robertson (Hodge 80), Petrie, Henderson, Beith, Bikey, Davidson, Kavanagh (Ferns 61).